Tre Biccieri? Well first off it translates to Three Glasses., and this is the system for rating the top wines in Italy by the famed Gambero Rosso Tre Bicchieri Italian Wine Guide compile and published each year by Gamabero Rosso Publications. Italy's top wines are here. Gambero Rosso rates the wines on a 1, 2, and 3 glass system as opposed to others like Robert Parker and WIne Spectator which uses a 100 Point System. So at the Tre Bicchieri Tasting, all of the Tre Bicchieri (3 Glass Wines) Wines will be on hand. For an Italian Wine Guy like me, this is my favorite event of the year and although I love and enjoy all the great wines, it's actually more of a social event for me. 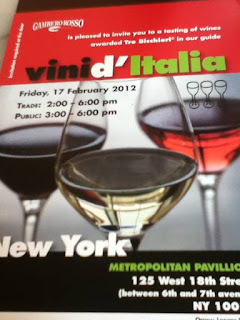 I get to see my many friends from Italy, winemakers, but mostly the proprietors of the many wine estates on hand. It's just great! Needless to say there are going to be many great wines on hand including; Sassicaia 2008, Turiga 2007, Donnafugat "Ben Rye" 2009 from good friend Antonio Rallo, Barolo "Monfortino" Riserva 2004 from Giacomo Conterno (Considered by many Thee Top Dog of All Barolo), Vietti Barolo Villero Riserva 2004, Mastroberadino Taurasi Radici 2007, Rosso del Conte Tasc d'Almerita 2007 from good friend Conte Giuseppe Tasca, Masi Amrone "Vaio" 2006, Planeta's "Plumbago" (Nero d'Avola), and many more. To many to mention here. Yes a lot of great wines, looking forward to tasting as many as I can, but even more so, seeing the many friends who make these wines, especially, Francesca Planeta, Sebastiano Rosa of Sassicaia fame, Merielisa Allegrini, Antonio Rallo, Giampaulo Venical with his great Sauvignon Blanc "Ronco de Mele," Rafaella Bologna with her renowned Barbera "Bricco dell' Uccellone 2009 and many more.As always, this is going to be a great event, Great Wines and Great Friends from the whole of Thee Italian Peninsular. Can't wait!